NEW YORK—Perhaps the best way to describe Gil Faizon and George St. Geegland—the two characters likely more famous than actors Nick Kroll and John Mulaney who play them—is one part Muppet (as in Statler and Waldorf), one part quintessential New Yorker, and just one bit of off-kilter creepiness tossed in for good measure. The result is nothing short of hilarious, with no intention other than to make you laugh out loud. Kroll and Mulaney are in tip-top form here, seamlessly embodying characters they created a decade ago, and previously seen on Comedy Central and Off-Broadway. This current incarnation, in “Oh, Hello on Broadway,” continues through Jan. 8 at the Lyceum Theatre. Kroll and Mulaney are in tip-top form here. Bachelors both, Gil and George have been friends for over 40 years. George is a novelist and playwright who has been married three times, each of his wives having died in the same way on the same staircase. He’s also on what he calls competing medications, including antipsychotics. Gil, meanwhile, is “the strongest actor in New York” and one who refuses to commercialize himself for any reason; he’s that serious about his craft. His chief claim to fame is that he once almost became the voice of CBS. The two live on the Upper West Side of Manhattan, also known as “the coffee breath of neighborhoods,” and look like those old irascible fellows you can almost picture sitting on a park bench, reading their favorite novels and commenting on the world around them. At least George fits this description, thanks in part to the sweater he always wears. Gil in actuality looks more like the perennially unmade bed, with his shirt often sticking out of his pants. George has written several stage works. These include “True Upper West” and “Waiting for Godot … Hello!” in which the title character actually shows up. After a hysterical dissertation on some well-used theatrical elements (the one-sided phone conversation and the final supposedly profound lines of plays that instead make the audience shake their heads in puzzlement), George introduces his latest work. The play is a semi-autobiographical story about two old friends living on the Upper West Side of Manhattan, who are facing the loss of their rent-controlled apartment—that is, until fate intervenes in the form of potential television stardom. The show takes aim at several audience faux pas, like those who arrive late and/or who leave in the middle of a show, as well as the use of cellphones. 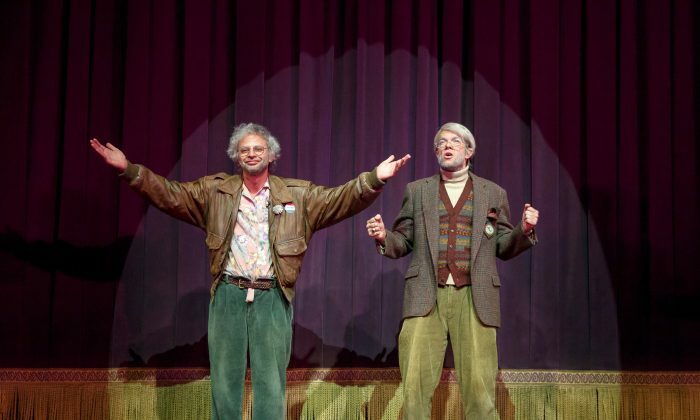 Gil and George urge the audience to turn them on, while giving out glares that dare anybody to do so. They literally point out someone who tried to unwrap candy during the show and once and for all debunk the myth that unwrapping candy slowly will actually result in less noise. On the whole, Gil and George’s friendship goes through some major struggles, with the question of whose happiness and comfort is more important coming up more than once. The pair are helped throughout by their unseen intern/indentured servant Ruvi Nandan. He functions as their entire tech crew, even getting a bio in the show program. The actors know exactly which buttons to push for maximum effect. Director Alex Timbers’s greatest strength lies in allowing Kroll and Mulaney to take the lead with the characters they’ve embodied for so long. It’s a process that works well for the most part, with very few moments of dead space in what is essentially nearly two hours of long-form sketch comedy. The actors know exactly which buttons to push for maximum effect while never really going over the top or staying on any particular subject (for example, Donald Trump) for too long. Filled with jokes and bits that are often politically incorrect and also occasionally unprintable, “Oh, Hello on Broadway” is a supremely enjoyable and satisfying experience.